The progressive loss of a coat color is called “greying“. Grey is actually considered to be a pigment disease, because the loss of pigment is caused by the progressive dying off of the pigment producing cells (melanocytes). Foals with the grey mutation are often hyperpigmented at birth. The mutation causes melanocytes to produce large amounts of pigments until they eventually “burn out”. New hair being grown comes in without color since melanocytes no longer produce pigments. The speed of this process is highly individual and depends on factors including breed and genotype (horses with two copies of the grey allele tend to grey more quickly). Pigment loss is also observed in the skin (“Vitiligo”) which results in pink colored areas around eyes and muzzle. A grey horse will pass different stages during the greying process that lead to temporary coat colors like dapple grey or rose grey Some horses may become completely white while others retain a small amount of pigment for many years. There may also occur partial repigmentation (“fleabitten”, “blood marks”). 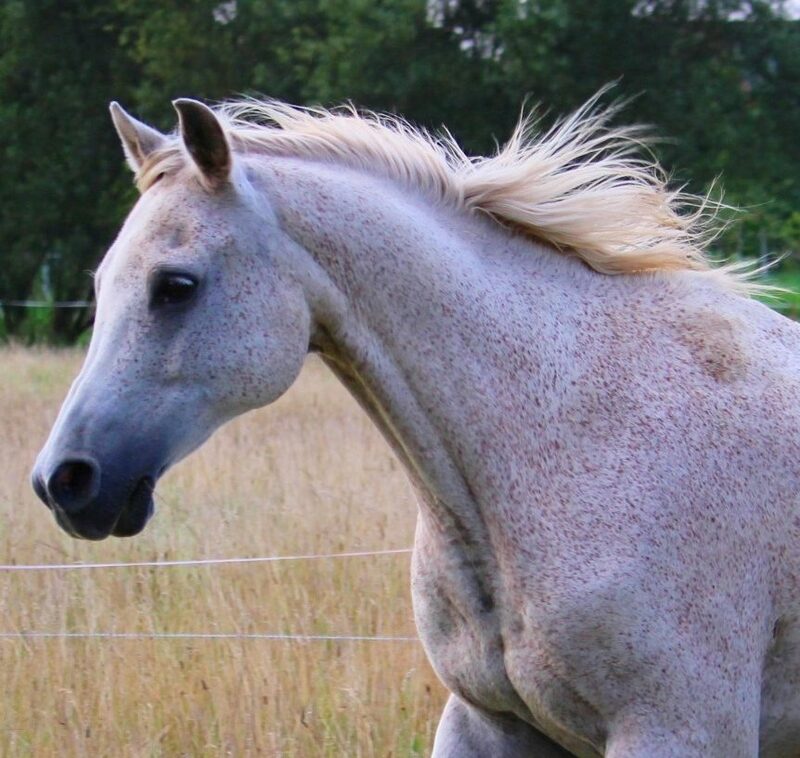 Whether this repigmentation occurs or not seems to depend on the horse’s genotype: Heterozygous greys seem to be more likely to develop these spots than homozygous horses. The grey phenotype is also associated with diseases: the mutation upregulates a cancer pathway, and thus greys are at a higher risk of developing melanomas. Roan is a coat color phenomenon which varies seasonally. White hairs are evenly distributed over the body of the horse, leaving more pigment on the legs and face. A roan horse will generally be much darker in the winter than in the summer. Roan has not yet been fully characterized at the molecular level, as the causitive mutation has not been identified, but it seems to be linked to the KIT gene. A linkage test has been developed, but is not offered by CAG. The roan phenotype follows an autosomal-dominant inheritance with the mutation affecting the KIT locus. Other mutations within this gene are causal for patterns such as Tobiano, Sabino-1 and White Spotting. KIT is also very important during embryogenesis. It was assumed for many years that two copies of this mutation would result in the early abortion of the foal. This is true in several breeds (Belgian, Brabant), but homozygote roans are possible in most breeds. For this reason it is hypothesized that there may be multiple mutations that cause the roan phenotype. 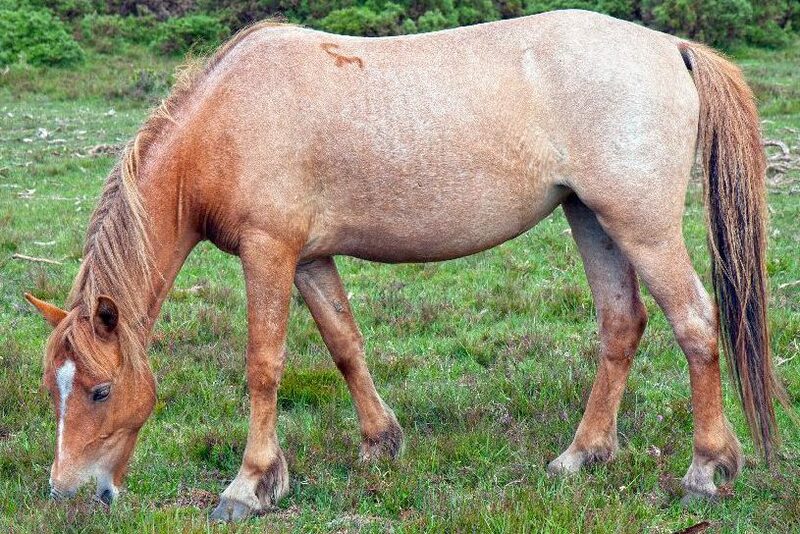 The roan coat color does not differ between horses with one and horses with two copies of the allele. The “fleabitten” phenotype is caused by the repigmentation of previously depigmented hairs. These spots can vary in color between reddish-brown and very dark/black, and do not indicate the horse’s original color. A roan horse usually has more pigment on its face and legs, and varying amounts of white ticking evenly distributed throughout the hair on the torso. The amount of white varies between the seasons. Picture: Chestnut roan. Mare with dappled body and fleabitten head. The filly behind is beginning the greying process.